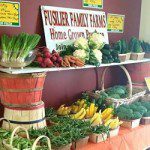 Fusiliers Family Farm is proud to be fifth and sixth generation run family farm devoted to fresh, high quality produce marketed directly through local farmer’s markets, a Community Supported Agriculture (CSA) program, and our recent opportunities to provide fresh produce to a growing number of area school districts in Jackson, Washtenaw, and Lenawee counties. Our Share of the Farm (CSA) program is an excellent way to receive great flavors of Michigan’s produce each week. Members receive a basket of fresh, premium quality, all natural produce each week of twenty-two weeks from June through October.